Hamas marine security boats practice off the Gaza coast Wednesday for the expected arrival of an aid flotilla this week. Jerusalem (CNN) -- The Israeli government said Thursday it will stop a convoy of cargo and passenger ships filled with supplies and headed to Gaza to break a blockade imposed by Israel in 2007. Government officials said Wednesday they have given the Israeli Defense Forces instructions to reroute the flotilla to Ashdod port in Israel, where the supplies will be unloaded and transferred to Gaza. Mark Regev, an Israeli government spokesman, called the flotilla "a cheap political stunt." "If they were really interested in the well being of the people of Gaza, they would have accepted the offers of Egypt or Israel to transfer humanitarian aid to the people of Gaza, along with the other 15 thousand tons sent every week," he said. The convoy, which left various European ports, is organized by two major groups: the Free Gaza movement, a pro-Palestinian human rights organization, and the IHH movement, a Turkish humanitarian relief foundation affiliated with the Islamic Brotherhood. Organizers said the convoy is carrying 10,000 tons of construction material, medical equipment and school supplies, and about 750 activists of different nationalities. Israel's Ministry of Foreign Affairs, said Yossi Gal, its director-general, has summoned the ambassadors of Turkey, Greece, Cyprus, Sweden and Ireland -- the countries from which the flotilla set sail -- and "clarified the state of Israel's official position, which declares the flotilla an absolute provocation: There is no shortage of humanitarian aid to Gaza, as food products, fuel and supplies are constantly transferred into the Gaza Strip by the international organizations." The flotilla is "invited to dock at Ashdod port, to unload their cargo and transfer it to Gaza, after a security check, either via the Israeli authorities or via the humanitarian organizations," the ministry said. Hanin Zoabi, a member of Israel's parliament, the Knesset, and a passenger on the flotilla, called it a "humanitarian campaign for the 1.5 million Palestinian people who Israel put in jail for about the last four years without allowing building material, without educational material, without food into the Gaza strip. "Israel destroyed 165 schools and more than 100 (factories) and destroyed tens of thousands of houses without enabling the Palestinians to rebuild their homes and their lives," Zoabi said. "This is a very strong political message towards Israel and towards the Arab world that stood silent regarding what is happening in Gaza." Israel imposed the naval blockade on Gaza after the Hamas forcefully took control of Gaza in 2007, ousting the Fatah movement headed by Palestinian Authority President Mahmoud Abbas. Regev argued that the activists maintain a double standard when it comes to Hamas' actions. "They call themselves human rights activists, but they remain silent when it comes to Hamas' deliberate targeting of Israeli civilians and the brutalities of the Hamas regime in Gaza, which has crushed political opposition, suppressed independent media and has locked up hundreds of political opponents." Sarah Weiss Maudi, an Israeli Foreign Ministry legal expert, said, "The naval blockade has been imposed by Israel because Israel is currently in a state of armed conflict with the Hamas regime that controls Gaza." Under international maritime law, when a maritime blockade is in effect, no vessels can enter the blockaded area. Maritime blockades are a legitimate measure under international law, and may be implemented as part of an armed conflict at sea, Israeli officials have said. 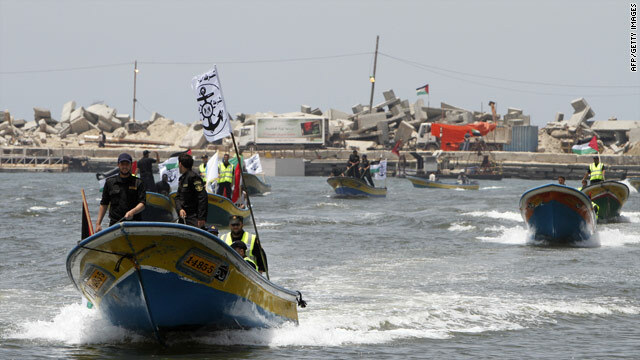 "The objective of the boats is to break Israel's siege on Gaza, to break Israel's blockade on Gaza. The material that we have on board are all of the materials that Israel denied to the people of Gaza like cement, building supplies, educational supplies etc," said Greta Berlin, co-founder of Free Gaza movement. "We do not accept the siege on Gaza," said Zoabi. "... Israel does not want a siege. It wants a silent siege. Israel does not want occupation, it wants a silent occupation. It wants its policies to go without criticisms of the world. That's why it wants to stop the flotilla and also avoid coverage of the event," she said. "... This is an important aim of Israel, is to stop the cameras in order for the participants who are participating in this flotilla and the others who are following it not to see the aggression of the Israeli army, but I think this does not threaten us and it does not bring fear among us," she said. Gilad Shalit has been held captive since June 2006, when Palestinian militants from Gaza captured him. Noam Shalit says his son has been kept in total isolation for the past four years, a violation of international conventions and against international law. There have been eight naval convoys to Gaza until now, and Israel has allowed three to dock at the Gaza port. Israeli Foreign Ministry spokesman Yigal Palmor said that since January 2009, more than a million tons of humanitarian supplies entered Gaza from Israel. The most efficient system to transfer goods to Gaza is through the land crossings, Palmor said. Asked if he was concerned about being arrested, Zoabi told CNN, "I am not worried because I am not doing anything against the law. What I do is according to human rights, according to international values and according to universal values, so it is not against the law. "I am (a) Knesset member, and this is part of my political responsibility," she said. "It is part of my human responsibility. This is not against the law to aid people, to help and support (those) who are under siege ... I think the side that is breaking the law, international law, and breaking the human values is Israel and not anyone else." CNN's Kareem Khadder contributed to this report.